the gun to produce an equal and opposite reaction which tends to drive the entire gun to the rear. The forcc resulting from this reaction is called the "recoil force" and the magnitude of this force at any instant depends on the chamber pressure. Fig. 2-2 shows how the chamber pressure varies with time in a typical 20-mm gun with a total barrel length of slightly less than five feet. The parts into which the curve is divided show the proportion of the pressure expended in producing the velocity of the projectile and in imparting motion to the powder gases. (A very small proportion of the total pressure is expended in overcoming bore friction and in imparting rotation to the projectile, but this proportion is too small to be shown in the figure.) The pressure producing the recoil force is the total of both parts of the curve. Fig. 2-2 shows that the recoil force docs not immediately cease when the projectile leaves the gun after 0.00234 second but continues to act until the residual pressure falls to zero at approximately 0.008 second. The effect of the recoil force on the gun depends entirely on how the gun is mounted. 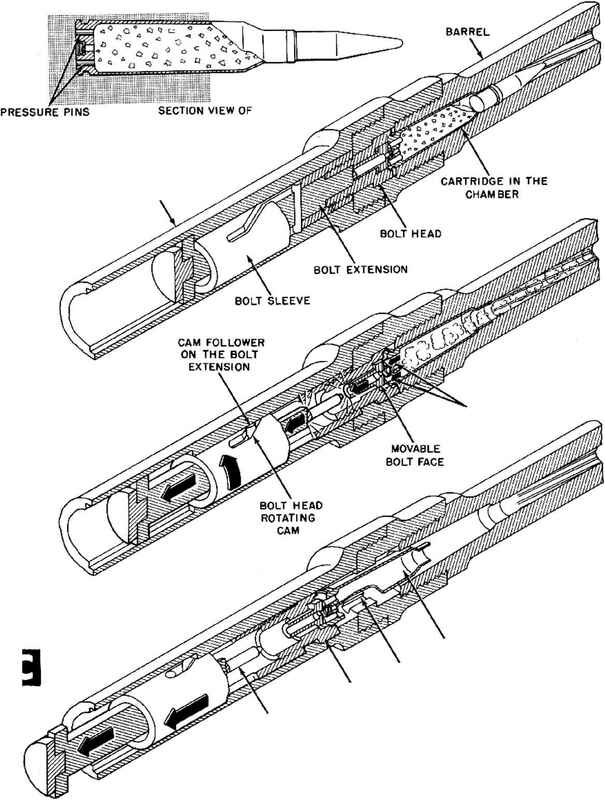 If it is assumed that the gun is mounted so that it can move freely without friction or any other restraint, the impulse of the recoil force (acting over the entire 0.008 second) will impart to the gun a rearward momentum equal to the total forward momentum of the projectile and powder gases. The velocity of the gun will depend on its mass; the smaller the mass, the higher the velocity. When the residual pressure falls to zero at 0.008 second, the gun will have achieved its maximum velocity and since it is assumed that there are no external restraining forces, the gun will continue to move at this velocity. This hypothetical condition is referred to as the condition of "free recoil". Figure 2 1. Elementary Gun.